We are pioneer in this industry, we offer monkey cage all over India. 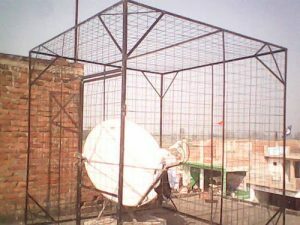 Monkey / Antenna cage is used to protect VSAT from monkeys and playing children. Even a small disturbance can stop reception of signals on VSAT; antenna cage protects all kind of disturbances. Since VSAT is a valuable item. A Very Small Aperture Terminal (VSAT) is a two-way satellite ground station dish antenna that is mostly 1.2 meters. VSATs are most commonly used to transmit narrowband data (point of sale transactions such as credit card) or broadband data(for the provision of satellite internet access to remote locations, VoIP or video). Since VSAT is configured three dimensionally; so it can be disturbed by any outer body. We fabricate a cage around VSAT to protect it. We provide provision for lock also. It can be customized according to need. We use 4×4 or 3×3 inch mesh and mostly 4 feet pillar section into it to receive proper signals. It is made up of mild steel. We do enamel paint by compressor method on cage to avoid rusting. It is free from any maintenance. The beauty of our Antenna cage is that it can be assembled very easily with the help of two persons and it can be dismantled also for installation on another location.